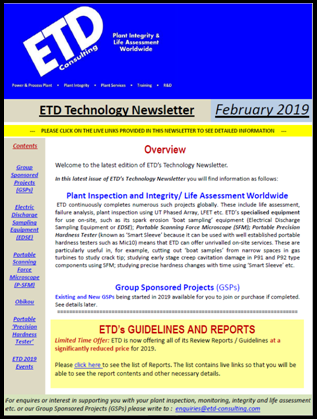 Welcome to the latest edition (February 2019) of ETD's Technology Newsletter. Please click on the image to access the Newsletter. This illustrates various power and process plant activities (inspection, integrity and life assessment worldwide) and new technologies and methodologies developed or being developed for plant inspection, integrity and life assessment through our Third Party and Group Sponsored Projects (GSPs). 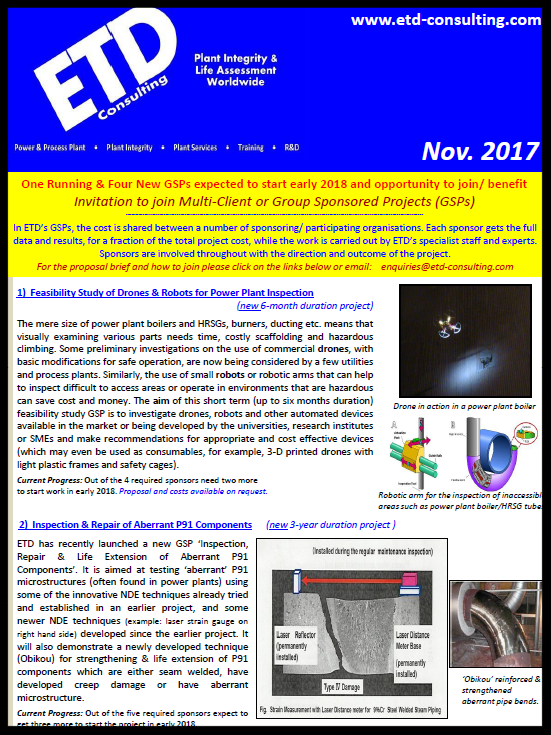 Please click on the image below to access the latest edition (October 2018) of ETD's Technology Newsletter. This illustrates various power and process plant activities, new technologies and methodologies developed for plant inspection, integrity and life assessment through our Third Party and Group Sponsored Projects (GSPs). 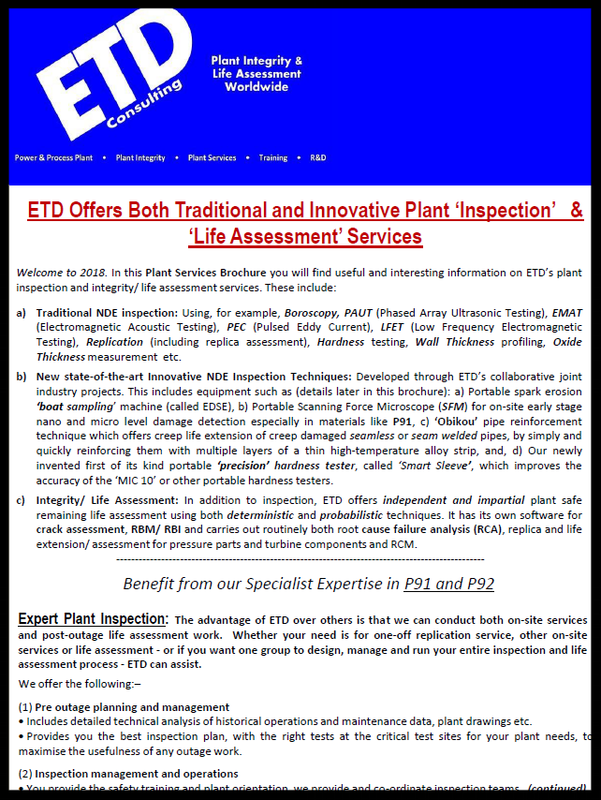 Also in this newsletter you will find useful and interesting information on ETD’s unique Services for New & Running Plants involving Inspection, Monitoring, Assessment & Life Extension Services using various state-of-the-art techniques like Scanning Force Microscope (SFM) for early stage damage detection, Miniature sample removal (boat sampling) for quality checks and life/condition assessment, Precision Portable Hardness Tester (known as ‘Smart Sleeve’), ‘Obikou’ for Pipe Strengthening and Life Extension and Defect/Crack Assessment. Please click on the image below to access the latest edition (February 2018) of ETD's Technology Newsletter. This illustrates various power and process plant activities, new technologies and methodologies developed for plant inspection, integrity and life assessment through our Third Party and Group Sponsored Projects (GSPs). Also in this newsletter you will find information on our next Conference & Training Course which will take place in London in July 2018. The Conference will be on Power Plant Operation & Flexibility and will be preceded by two optional 1-day Training Courses on 'Power Plant Operation, Maintenance & Materials Issues' & 'Power Plant Long & Short Term Preservation'. 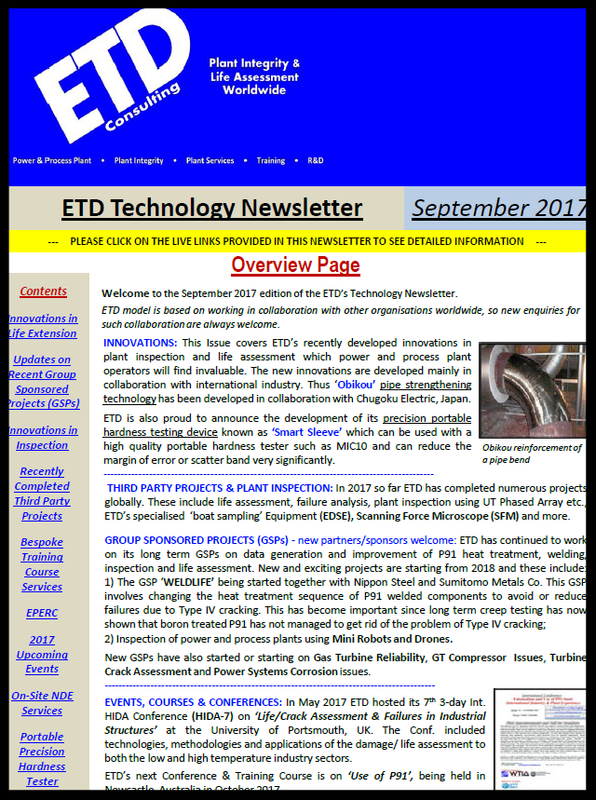 Please click on the image below to access the latest edition (September 2017) of ETD's Technology Newsletter. This describes various power and process plant activities, new technologies and methodologies developed for plant inspection, integrity and life assessment, material quality checks, issues with P91 & P92 Steels, new industry (third party and Group Sponsored) projects and other initiatives such as ETD’s plant services for inspection and life assessment. Special acknowledgement must go to page 9, which provides information on ETD’s various forthcoming Training Courses and Conferences during 2017. Particular mention must be made of our upcoming 2-day Conference on Fabrication and Use of P91 Steel: International Industry & Plant Experience. (preceded by a 2-day Training Course on P91-P92 Issues) which will be held in Australia next month. 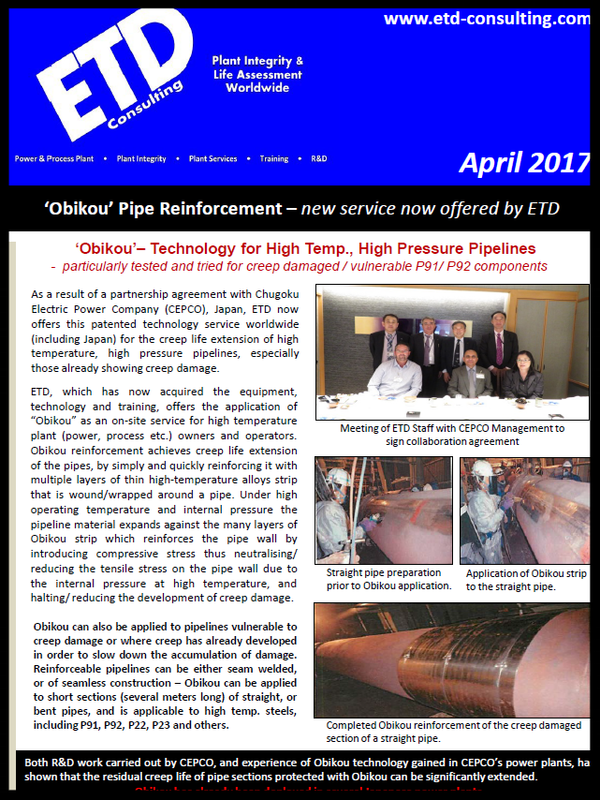 Please click on the image below to access the latest edition (January 2017) of ETD's Technology Newsletter. This describes various power and process plant activities, new technologies and methodologies for plant inspection, integrity and life assessment, material quality checks, issues with P91 & P92 Steels, new industry (third party and Group Sponsored) projects and other initiatives such as ETD’s plant services for inspection and life assessment. Special recognition must be for pages 1-4 which discuss ETD's offer of new patented technologies for the inspection, monitoring, repair and life extension of high temperature plant components. These are particularly, but not exclusively, suitable for P91 and P92 components. References and details can be provided on request. Also on page 9, please see information on ETD’s various forthcoming Training Courses and Conferences being held in the UK, Italy and Australia during 2017. Particular mention must be made of our popular series of HIDA conferences - HIDA-7 (followed by a 2-days Training Course on Crack Assessment in Industrial Components) which will be held in the UK in May 2017. Please Note Limited Time Offer: ETD is now offering its Reports / Guidelines at 50% of the announced price for a limited time. This will only apply to orders received and paid for during the months of January and February 2017. Please click here to see the list of Reports. The list contains live links to see the report contents and other details.